THE EUROPEAN UNION’S top court should cancel Swiss food giant Nestle’s trademark for the shape of the Kit Kat chocolate bar, the court’s top adviser said today. Nestle has been locked in a decade-long battle with US rival Mondelez, maker of Cadbury chocolate, over the four-fingered wafer biscuit, which was first sold in 1935. Advocate General Melchior Wathelet said the European Court of Justice (ECJ) should dismiss an appeal by Nestle against a lower court’s 2016 decision to annul the trademark. “Nestle did not adduce sufficient evidence to show that its trademark had acquired distinctive character,” Wathelet said. He said the intellectual property office should now “re-examine” its decision. The Luxembourg-based ECJ often, but not always, follows the advice of the advocate general, its senior legal advisor, when making its final judgement. 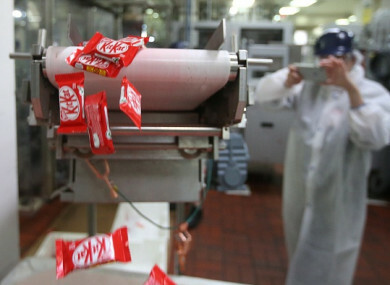 The food giant specifically failed to show that the Kit Kat shape was well enough known in Belgium, Ireland, Greece, Luxembourg and Portugal, relying instead on market data from other countries, he said. The official also said the EU court should reject an appeal by Mondelez against part of the judgement, saying it was “manifestly inadmissible”. Nestle has already lost a legal bid in Britain — currently an EU member state but set to leave next year — to trademark the Kit Kat shape. Email “Nestle given thumbs down on Kit Kat finger shape by EU court”. Feedback on “Nestle given thumbs down on Kit Kat finger shape by EU court”.